Sometimes movies give us a glimpse into an alternate reality or some possible future. Even the worst of these movies typically offer a look at what the people of these worlds drive. Sometimes the cars are cool, and sometimes they’re a Lexus concept you forgot about in 2002's Minority Report. I’ve hinted in the past about how the cars and traffic systems of Minority Report raise an alarm in the back of my mind when I think about our projected autonomous future. Sure, the blob-ish cars look pretty cool, but it’s the way they move around vertical surfaces at high speeds that gets me queasy. If you took a liking to the vehicles you saw in Minority Report, eBay user ferrarimv, or Mike Vetter, is selling his Lexus 2054 replica movie car for just $95,000. He’s also willing to do a partial trade on a C6 Corvette. Again, this is just a replica of the concept car that Lexus developed upon request from director Steven Spielberg for the movie, and not the actual concept. 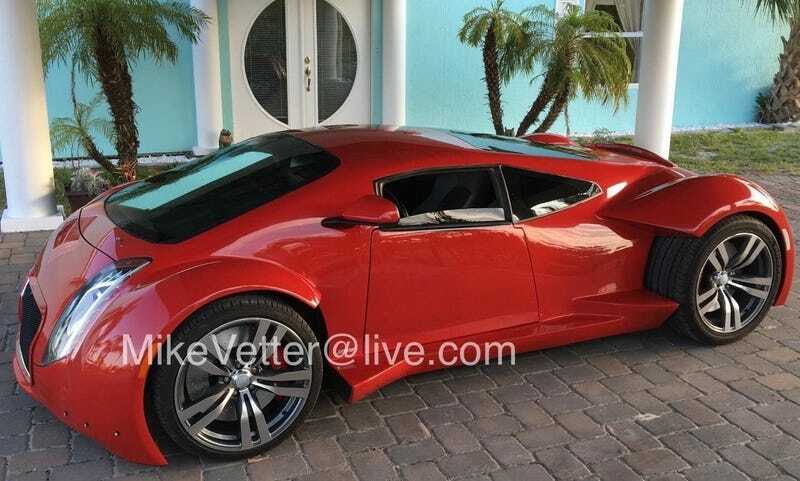 According to the eBay listing, the renamed Vetter Custom Dimensia is based on a Porsche, RWD and powered by a 2.7 liter 6-cylinder with an automatic transmission. Some of the custom car’s other features appear to be street legal, but whether you’re willing to trust the whole package is up to you and your wallet. The listing promises a solid build, with advanced amenities like being able to speak on the cellphone in the cabin with enough space for a six-foot-tall person to fit just fine. And, personally, it looks like a backup movie prop. Sort of like a movie gun—there’s the hero gun which is meant to look realistic, and then typically a rubber backup that the actors use to throw around. This seems like the latter in a car equivalent. Just like the bizarro future Minority Report previewed, this car just might preview the typical eBay vehicle listing in 2054. And what are you going to cross-shop it with? A replica I, Robot Audi whatever? A Honda CRX Back To The Future “homage” disaster? I do have to ask; Nice Price or Crack Pipe?